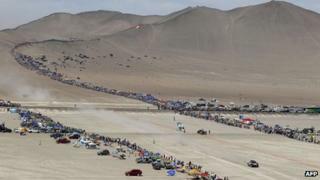 Two people have been in killed in Peru in a head-on collision involving a support vehicle for the Dakar rally. The victims were travelling in a taxi which hit a Land Rover from a British team of injured army veterans. Seven people - three of them Britons - were injured in the crash. Peruvian police are investigating the circumstances of the accident. The Dakar is billed as the world's toughest race. It has been staged in South America since 2009. Three members of the British team, Race2Recovery, were flown to hospital in Lima. They are reported to be "stable and conscious" with injuries described as "non-life-threatening". The men were named as Justin Birchall, 40, a team driver and civilian volunteer from Burnley, Lancashire, whose vehicle retired earlier in the race, former Royal Electrical and Mechanical Engineer and Gulf War and Falklands war veteran Lee Townsend, a team mechanic, from Yate near Bristol, and retired Army Major John Winskill, 42, the team logistics expert, who is from Durrington, near Salisbury, Wiltshire. Four passengers from the taxi are also being treated in hospital. Another taxi overturned while swerving to avoid the crash wreckage, but no-one in this vehicle is thought to have been seriously hurt. Race2Recovery, which raises funds for military charities, said their vehicle had been travelling a convoy of support vehicles. The team leader, Captain Tony Harris, said: "Our hearts go out to the families and relatives of those who have died in this tragic accident and we offer them our condolences and sympathy." Captain Harris, who lost a lower leg while serving in Afghanistan, said that the team had agreed to continue the race. "The team decided before we even started that we would continue our endeavour. This is obviously a huge shock but we know that we have the blessing of the injured. They want the team to finish." The rally began in Lima on Saturday and will finish in southern Chile on 20 January. It was moved to South America after the 2008 race along the former route - from Paris to Dakar - was abandoned because of threats to the competitors from armed groups in North Africa.